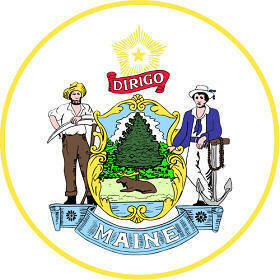 The Maine state seal identifies government buildings and officials and is a centerpiece for the Maine state flag. The symbolism, history and emblems of the Maine seal are described in this article with fast facts and information. The bright yellow five-pointed Polar star displayed above the motto is a symbol of the unity of all things and the essence of the life force. The "Polar Star" is the brightest star in Ursa Minor and conveys the idea that just as a star guides a sailor home, the State of Maine guides its citizens toward the concept of patriotism, family and of home. The first man depicts a farmer (husbandman) with his hand resting on a scythe and is a symbol of the importance of agriculture to the state. The main image in the shield is the White Pine, the Official State Tree and ideas conveying the landscape of Maine. 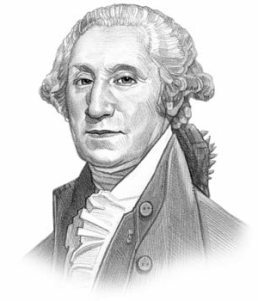 The Maine seal is kept and used as required by the Constitution and laws of the state. This is a flyer depicting the 1876 design of the Maine seal. The images surrounding the shield reflect the lifestyle and the importance of timber to the early settlers of Maine. The system of 'Mixed husbandry' inspired a distinctive form of architecture in which farm buildings such as the shed and barn were connected to the house and this is depicted in the picture of the house. Official Nickname "Pine Tree State"